Just four weeks ago, a top two finish in the U18 Professional Development League looked likely for the youth team but a disappointing finish means we will end the season in either fourth or fifth place. It was a similar story last Saturday when we travelled to Cardiff for our final game. Mitch George gave us an early lead but a burst of three goals in seven minutes for the home side put paid to any hopes of a result. Edon Pruti became the second player sent off in the last two games and we ended the game on the wrong end of a 5-1 scoreline. The result was significant in both the north and south groups. For us, with Nottingham Forest losing at Crystal Palace, it would have assured us of a third place finish, but fourth could become fifth should Sheffield United win their last game which is an important one at the top of the north group. Ipswich kicked off with a one point lead over Cardiff at the top of the south group but with Ipswich having a game in hand they were clear favourites to finish top where they have been for virtually the whole of the season. They faltered though, Cardiff went above them with the win against us as Ipswich were soundly beaten 4-0 at home by Sheffield United. It left the Tractor Boys needing a win in their last game yesterday against Palace but they could only manage a draw which leaves Cardiff the champions by one point. Sheffield United will now be hoping to end the hopes of the favourites in the north group. Leeds held a one point advantage over Sheffield Wednesday and took that to four points with a win at Coventry, coupled with Wednesday losing 1-0 at Millwall. It left Wednesday four points behind but still with two games to play. They have since played the first one, beating Coventry yesterday, and now need a win or a draw to win the league this Saturday when the face Sheffield United away. Wednesday need a draw to win the league, United need a draw to move above us into fourth place. It’s been a disappointing finish for us but these last few games have been played without some of the regular second year scholars who were released by the club. That has clearly made a difference and the season now ends for us with the same number of points as we won last season albeit from two less games following the departure of Huddersfield. The play featured this week is Mitch George. His goal at Cardiff took him to double figures for the season, the only player to reach that total other than Michael Fowler who scored 18, the last two coming in his final appearance against Leeds in February. 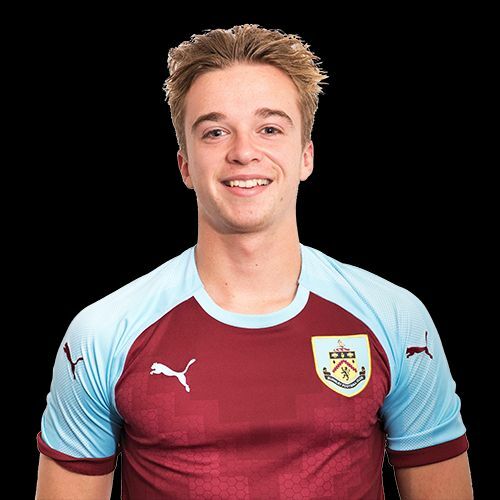 Up the Clarets, of course, wish him and the other players released the very best. Last week’s results, the remaining fixtures, our goalscorers and the current league tables are all below.